Ben Davies admits that it was a very tough decision to leave Shrewsbury Town for League Two rivals Notts County. 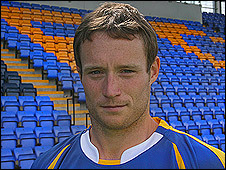 The former Shrewsbury skipper was offered a financial deal at Meadow Lane that Town felt they could not match. But 28-year-old Davies told BBC Radio Shropshire: "It was really hard, one of the hardest things I've had to do. "I still talked it over with my family and thought about it for a week but, in the end, County's ambitions persuaded me to sign." Davies was signed by former Shrewsbury boss Gary Peters from Chester in 2006. The free-kick specialist scored 30 goals in 120 appearances - and it might have been more had he not missed half the 2007/08 season with an ankle injury.